We’re in the final countdown. 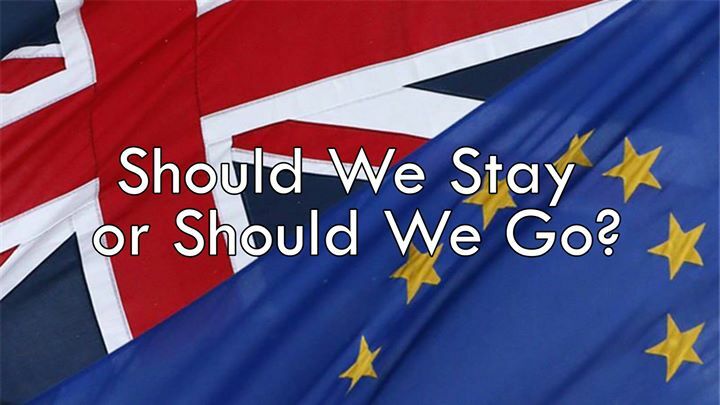 This week the UK will make a big decision on its EU membership: in or out? You decide! Sick of conflicting smears from the rival camps, sick of division and scaremongering of immigrants? Sick of being frightened into a decision? Well forget messers Cameron, Farage, Gove, Galloway, Borist et al for a minute or two – let’s look at the some of the songs of the EU referendum campaign 2016 to help us decide. Should we STAY or should we GO now? The highlights of which include the down-tuned version of ‘Killing in the Name of’ by Farage Against the Machine replete with the catchy lines like ‘some of those that are none Brits are the same that claim benefits’ replete with all the riffing and huhs of the original but with extra amusing Faragisms. The Iain Duncan Smiths also produced an album of parody sounds about the bremain side, but more of that shortly. Back to the feeble efforts from the leave side, Grassroots Out campaigner and former UKIP Stockton North Parliamentary Candidate Mandy Boylett‘s produced an ill thought out anti -EU themed version of ‘Four Lions’ by Baddiel and Skinner. Boasting a video that looks like it’s been done during a fag break in happy snaps, and all the musical quality of a pissed up karaoke night it’s laughably dreadful. Many on the left also have disquiet about the speed of European convergence, the corporate interests of the EU project. Indeed, their harsh treatment of Greece is but one example of the heavy-handed austerity that the EU comission sometimes brings to bare on its often quite different member states. There are songs on the European mainland that reflect this skepticism, one such is this anti-EU corruption song from German TV a pulsing early 90s dance beat ridden by an anti-EU diatribe. Who can forget the legend that is the ill-feted ‘UKIP Calypso’ by Mike Read, let’s try and forget for a minute the hilariously unaware bad faux-Carribean accent, the dreadful sight of an aged radio one deejay mate turning up like an unwanted bad smell to deliver a patronising load of claptrap? But the nightmarish idea of Farage as PM? Come on. Meanwhile, Kurt Corbyn‘s ‘Stay as We Are’ perfectly illustrates the impossible position Labour leader Jeremy Corbyn has been in during this referendum, advocating an EU system he doesn’t actually believe in because of his party, and that he can’t really win either way. With the upcoming EU referendum this week, erstwhile Super Furry Animal Gruff Rhys who delivered a luxurious love letter to the EU (“a 60 year old woman with ideals“) and the genuine “friendships I’ve felt as a touring musician living in the EU, as a child of the 1970s is all I’ve ever known”. It’s an achingly prescient and touchingly gorgeous antidote to Brexit, from a marvelously idiosyncratic songwriter. Well, he’s convinced me. I’ve written 3 Pro-EU songs now, and they’re very popular at the Brexit rallies! I’ts not bad. But I think you should post the lyrics, like Gruff Rhys did in his video.